The Land Rover Wolf is a military utility vehicle in service with UK Armed Forces and the Dutch Marine Corps. The vehicle is famous for being the primary utility vehicle of the British Army. Safety Devices has made many variations of ROPS for this vehicle over the years, catering for General Service (GS), Fitted for Radio (FFR) and Bowman variants. Safety Devices has manufactured an external front with internal rear section, as well as a fully internal assembly. 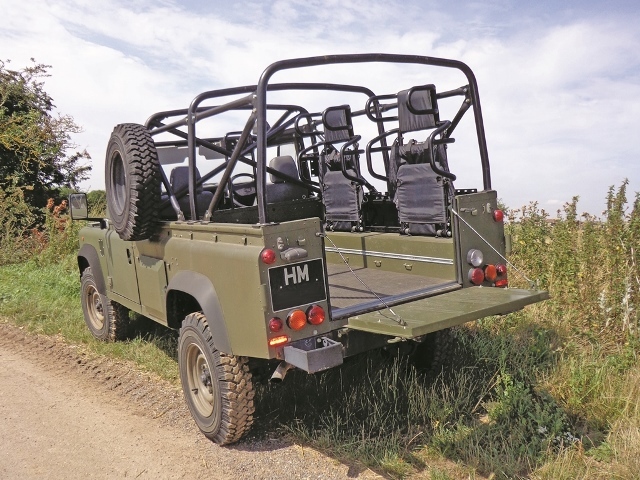 The safety improvements designed by Safety Devices for this popular military vehicle have been incorporated into the British Army's Vehicle Life Extension Program and has seen some 7000 Safety Devices ROPS produced. In 2013 Safety Devices developed sideways mounted seats for the Land Rover Wolf (pictured). The seats, which can be mounted either to the ROPS or directly to the vehicle, are made to European ECE Regulations 94 and 95, and US Regulations FMVSS 208 and 214.